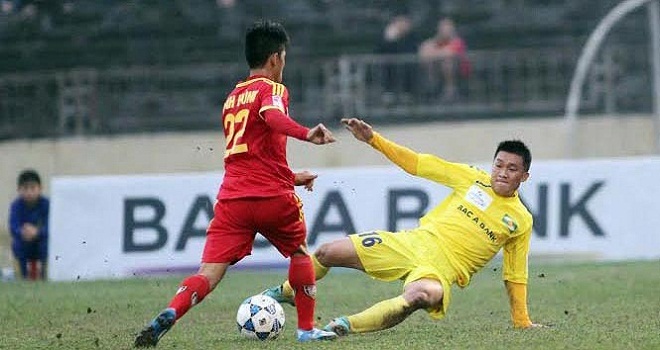 HA NOI (VNS) — A 28-game ban and a VND20 million (US$950) fine was the severest punishment for a football player in the history of the Viet Nam Football Federation (VFF). Defender Tran Dinh Dong of Song Lam Nghe An was fined after his violent fault resulted in a broken leg to midfielder Nguyen Anh Hung of Hung Vuong An Giang last week. The ban means that Dong can only return to the field in 2015. Meanwhile, Hung is expected to be sidelined for about one year. VFF said the punishment is meant to be a warning to players throughout the nation, where violent behaviour on the field has gradually become more popular. The national football body also asked Dong to pay the medical bills for Hung's injury and surgeries. Hearing about his fine, Dong said it was too heavy because he did not intend to hurt Hung, as the two were only involved in a strong vie. Coach Nguyen Huu Thang of Song Lam Nghe An agreed with Dong. "It is an unreasonable ban. He did not try to do that. Head of the V-League organisation Tanaka Koji and his assistant Tran Duy Ly also said it was an unfortunate injury," said Thang. "Reports from the referees had no comments about Dong's bad behaviour and An Giang's coaching board said Hung was injured partly because he wear leg protectors for children.